This voucher is only redeemable against our online accessories and can be emailed directly to a person of your choice. 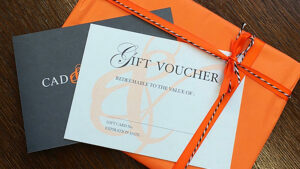 Our electronic gift voucher can be redeemed against any of our online accessories. Simply choose your amount, personalise your message and fill in the email address of the lucky recipient. A perfectly stylish gift for any dapper dresser.Read our gift voucher terms and conditions terms & conditions. We have two types of voucher available. This is an e-voucher which will be emailed to the address of your choice and is only redeemable online. We also offer a physical gift voucher which is hand written, posted to the address of your choice and is only redeemable in store.